Peppermint shows that Garner’s acting shows us that she a much bigger field of acting than she has shown. Parents will do almost anything for their children, but sometimes a grieving parent will do more than anything because they have no choice. They break the law, they don't care about consequences, and revenge replaces the word justice in a parents mind. Lakeshore Entertainment and Universal Pictures provide a grim portrayal of what a parent will do when they need to provide for their child but an even grimmer portrayal of when a parent needs to avenge their child. 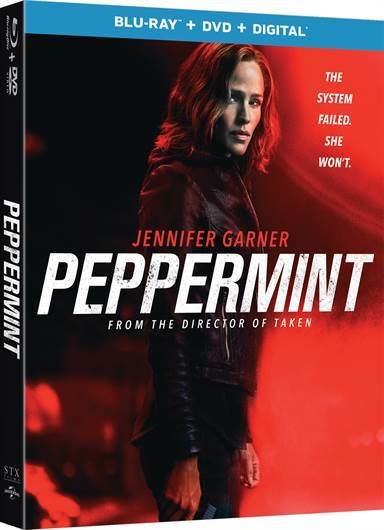 Peppermint stars Jennifer Garner (Alias) who plays Riley North, a wife, and a mother. Her husband, Chris, played by Jeff Hepner (Free Ride) is struggling to support their family. He considers joining a notorious plan to steal from a ruthless drug lord, Diego Garcia (Juan Pablo Raba; Entebbe) but by the time Jeff decides not to participate, Garcia has already found out about the plan and Jeff's involvement and in order to teach Jeff a lesson, Garcia has Jeff and their daughter Carly murdered. Riley, in a coma for a month after being shot in the head, awakes to desolation and intense grief, knowing she must face a life without her daughter and husband. Despite being able to identify the driver and shooter, the Judge, who is "on the take" from Garcia, releases the defendants. Riley ends up in a mental hospital but ends up escaping and spends five years away from society. Most people would spend that time grieving - Riley spends her time learning how to be every bit as dangerous- and more so- than Garcia. Garner seems to choose her movies carefully as she hasn't been on the big screen for two years. She was exceptional in this role, which seems to be a departure from her usual lighthearted, almost breezy, movie roles. While she has done action films previously, Peppermint was a great movie to showcase her deeper, more emotional and focused side as an actor. It is interesting to watch her thwart the FBI and LAPD but also gut-wrenching to see the human side of her that has been driven to this by a horrific event from which she will never recover. Despite Garner's stellar performance, the movie's storyline is slow to develop as it seems to focus on the bloodlust that which her character is consumed instead of the development of her psyche and a resolution or reaction aside from that to her grief and situation. Peppermint Blu-ray is presented in 1080p HD Widescreen with an aspect ratio of 2.39:1. Picture quality is good, with strong colors throughout the movie. For a Blu-ray, the quality is one of the best video presentations I have seen in years. I am curious to see what it looks likes when they finally release this in 4K on a disc. The audio is presented in DTS-HD Master Audio 7.1 soundtrack. Dialogue is clear and noise effects are appropriate and not overpowering. Besides the full-length theatrical feature, the Peppermint Blu-ray also comes with a DVD, as well as a digital code for the movie. In addition, two bonus features are found on the Blu-ray and presented in HD: Justice, which is a two-minute overview of the plot and characters and an Audio Commentary with Director Pierre Morel. Overall, Garner's portrayal of a mother with nothing to lose and everyone to kill is a riveting performance and it is nice to see her out of her usual carefree element. Peppermint shows that Garner's acting shows us that she a much bigger field of acting than she has shown. While the script itself falls flat, Garner's performance gives the movie hope. For her performance alone, Peppermint is worth the buy. Download Peppermint from the iTunes Store in Digial HD. For more information about Peppermint visit the FlickDirect Movie Database.